Test-driven development (TDD) is an approach to software development where you write tests first, then use those tests to drive the design and development of your software application. In this article, you will learn about a TDD approach called red, green, refactor, a framework that developers use to build a test suite, write implementation code, and optimize their codebase in short development cycles. The red phase is always the starting point of the red, green, refactor cycle. The purpose of this phase is to write a test that informs the implementation of a feature. The test will only pass when the its expectations are met. 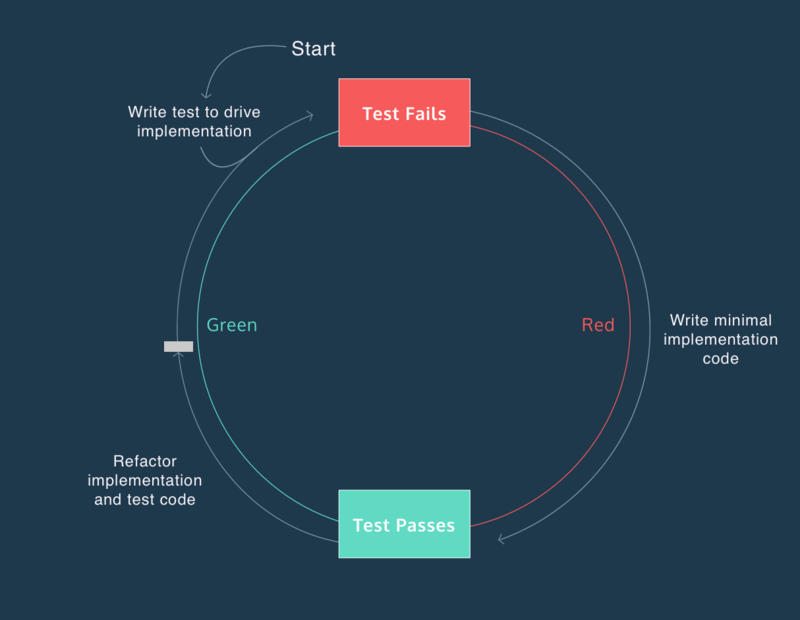 The green phase is where you implement code to make your test pass. The goal is to find a solution, without worrying about optimizing your implementation. In our sortArray example, the goal is to accept an array like [2, 4, 1] and return [1, 2, 4]. At the end of this phase, you are consider “in the green.” You can begin thinking about optimizing your codebase, while having a descriptive test if you do something wrong. In the refactor phase, you are still “in the green.” You can begin thinking about how to implement your code better or more efficiently. If you are thinking about refactoring your test suite, you should always consider the characteristics of a good test, MC-FIRE. If you want to think about refactoring your implementation code, you can think about how to accomplish the same output with more descriptive or faster code. Let’s take a moment to think about how I would approach refactoring my sortArray function. After doing some research of sorting methods, I find that I implemented the bubble sort method, which, it turns out, is not a particularly fast sorting method. I choose to change the method I use in sortArray() to the merge sort algorithm, because it has a faster average sorting speed than bubble sort. Do you notice anything different about this output versus the output we received at the end of the green phase? The new test code ran faster than before. The (7ms) next to 1 passing is shorthand for seven milliseconds, the amount of time it takes to run the test. At the end of the green phase, our test suite took nineteen milliseconds. Although a twelve millisecond difference is trivial here, the amount of time it takes to run a test suite increases considerably as your codebase grows. Can I make my test suite more expressive? Does my test suite provide reliable feedback? Can I reduce duplication in my test suite or implementation code? Can I make my implementation code more descriptive? Can I implement something more efficiently? If you take time during the refactor stage to ask these questions, you will likely end up with a more complete, reliable, and fast piece of software. In this article, you saw an example of how you can use TDD to improve confidence that your code is working as expected. You also saw how to use an existing test to keep you on track while you refactor implementation code. If you use red, green, refactor TDD to approach large software implementation problems, you will find yourself saving time, while implementing a more robust solution than you otherwise would have.